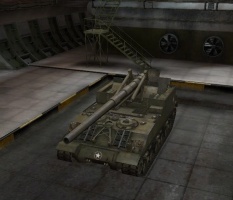 The M40/M43 is an American tier 8 self-propelled gun. Development started in the spring of 1944 due to a shortage of M1918 guns for the M12. The vehicle was based on the M4 Sherman and featured a HVSS-type suspension. The design allowed the 155-mm M1 gun and 203-mm M1 howitzer to be interchangeable (an SPG with the latter was designated the M43). The vehicle first saw service during Operation Zebra. A total of 418 M40 and 48 M43 vehicles were manufactured (another 24 M40s were reequipped). The M40/M43 SPG was built on a widened and lengthened M4A3 medium tank chassis. The vehicle is designated as the M40 Gun Motor Carriage in a version that mounts the 155mm M1A1 "Long Tom" gun. The version that mounts the 8-inch (203mm) Howitzer is designated the M43 Howitzer Motor Carriage. The M40/M43 leads to the M53/M55. 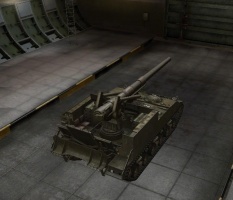 The M40/M43 has excellent mobility compared to the other hard hitters in tier 8, G.W. Tiger P. and SU-14-2. 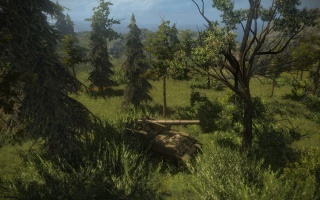 It is on the higher end for shell damage in its tier, with higher shell damage than the Lorraine 155 51 and FV207, tied with the SU-14-2 and only outclassed by the G.W. 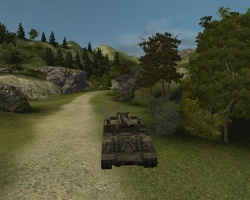 Tiger P. However, it has lower mobility than the Lorraine 155 51 and FV207. 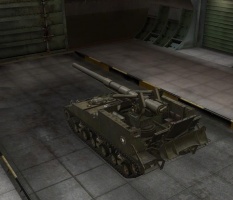 Due to its high damage combined with adequate accuracy, reload, and good mobility when fully kitted out, the M40/43 is arguably the best tier 8 artillery piece, and thus sees Clan Wars use during events with a tier 8 cap. 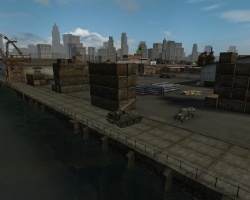 Brothers in Arms and Snap Shot are highly recommended crew skills to train. Both upgrade engines and both upgrade radios carry over from the M12 if researched there. The suspension upgrade is necessary to handle the weight of the top engine and gun. Not necessarily tank research, but train "Brothers in Arms" and "Snap Shot" on your crew. these skills greatly help this artillery piece. 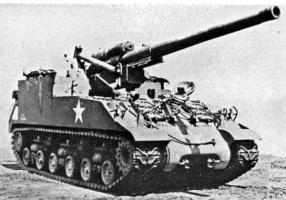 The 155 mm Gun Motor Carriage M40 was a US self-propelled artillery vehicle built on a widened and lengthened Medium Tank M4A3 chassis, but with a Continental engine and HVSS (Horizontal Volute Spring Suspension) that was introduced at the end of the Second World War. 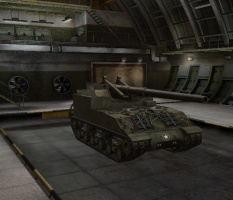 Equipped with a 155 mm M2 gun, it was designed to replace the earlier M12 Gun Motor Carriage. Its prototype designation was the T83, but this was changed to the M40 in March 1945. A single pilot vehicle was used in the European Theatre in 1945 by the 991st Field Artillery Battalion, along with a related 8-inch Howitzer Motor Carriage T89, which was sometimes also equipped with a 155 mm barrel. From there, it was deployed during the Korean War. After World War II, the M40 was used by the British Army, who designated it the 155mm SP M40. 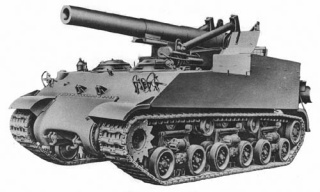 A version on the same chassis mounted an 8-inch (203 mm) howitzer and was designated the M43 Howitzer Motor Carriage. It was standardized in August 1945, 48 were built. The M43 saw action in the Korean War. Cargo Carrier T30- a few built before cancellation in December 1944 to make more chassis' available for GMCs. 8 inch Howitzer Motor Carriage M43- 8 in (203 mm) HMC, standardized August 1945, 48 were built. M40 Gun Motor Carriage and M43 Howitzer Motor Carriage Photos & history. This page was last modified on 17 September 2018, at 08:42. This page has been accessed 25,041 times.